Archaeology and Metal Detecting magazine Editor Dave Sadler was invited to be interviewed by the leading Facebook group in its Genre – British Medieval History this week. Here we thank Dave Pilling of British Medieval History for his permission in publishing the interview. 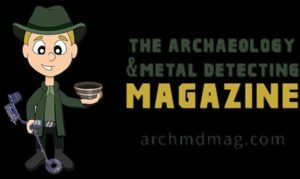 It is also thanks to Dave that we ourselves will be introducing a similar concept to the magazine, with leading figures from the Archaeological, Historical and Metal Detecting Communities. BMH: Hi Dave, please can you tell us a bit about what first got you interested in medieval history? DS: I’m from Ellesmere Port originally, so as a child was force fed roman and canal history due to the local canal network and Chester being a few miles away. As I entered adulthood I became engrossed in the paranormal and local legends. One such tale regarded the anchorite cell in Chester and the alleged grey lady on its lawns. Through research I found the cells history had plenty of tales in itself, which led to learning the story that King Harold Godwinson, Britain’s last Anglo Saxon king was actually brought to the cell in secret after his so thought death at the battle of Hastings. Here he led the rest of his days as a hermit. And the grey figure was supposed to be his consort visiting him. Probably not true, but the tale and the whole Hastings history and the beauty of the cell opened my eyes to the medieval and the nearby architecture of the Chester rows gave me a new sense of value to the era. Following into being a metal detectorist, the love has continued with the finding of medieval items and visiting medieval sites. The era was so large, it gives so many exciting areas to study. BMH: You mention that you are a keen metal detectorist. You are currently the editor of Archaeology and Metal Detecting Magazine and I know you are also the chairman of the Tempus Archaeology and Metal Detecting Group (based in Congleton). Do you also manage to hold down a full time job? DS: Yes, I’m an engineer at JCB in Uttoxeter. BMH: What was your motivation behind founding the magazine? DS: I launched the magazine as I am passionate about both subjects. I’d like to help bridge the gap between the subjects. I felt there was a place for the magazine covering all aspects of the subjects and act as a central hub for the information on the site and bringing news stories into one location save folk searching for them. I hope folk will utilise the site as a research area too as the magazine includes many such links and pdfs etc. BMH: Is this a paid gig? DS: No, the magazine is totally free. So it’s a home from work and around family thing. It’s hard to get articles submitted. It is easier now, I have a co-editor Luke Higgins, who has helped take the magazine to another level. BMH: So it is very much a labour of love for yourself? Have you studied archaeology at any level or has it been an interest you have had to pursue alongside your full time profession? DS: Yes. Very much the labour of love. I’ve completed several online courses and I’ve studied all the archaeology course books. But time and money have been an issue. BMH: I’m sure many BMH group members will be able to relate to that sentiment. Can we ask about your favourite finds to date both archaeology and metal detecting wise? DS: My personal best find in archaeology was inadvertently moving and poking at rocks and flooding a site. Apparently it was a lost well in Llanarmon yn lal, North Wales. Research by others suggested it had been their years ago, but location lost. Metal detecting wise would be my part in a Jetton hoard. The article of which is on the website in the articles section. We have discovered additional Jettons in the last few weeks. In reporting. I have organised 3 charity metal detecting rallies. 4 for the Mayor of Rochdale and one for the Bosley mill disaster fund. At the latter a guided medieval hairpin was discovered and a palstave bronze axe. Both were absolutely beautiful. At the rally 2 years ago, a civil war cannon ball got my juices flowing too. BMH: Thanks for your time Dave and best of luck with the magazine and with future finds. Thanks again to Dave Pilling and the British Medieval History group, Please visit the group for constant information, study and research from all areas of British Medieval History.